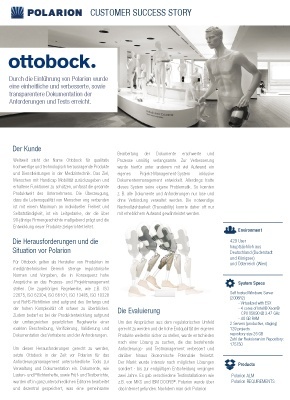 Weltweit steht der Name Ottobock für qualitativ hochwertige und technologisch herausragende Produkte und Dienstleistungen in der Medizintechnik. Das Ziel, Menschen mit Handicap Mobilität zurückzugeben und erhaltene Funktionen zu schützen, umfasst die gesamte Produktwelt des Unternehmens. Durch die Einführung von Polarion wurde eine einheitliche und verbesserte, sowie transparentere Dokumentation der Anforderungen und Tests erreicht. Durch Compliance-konformes Entwickeln wird aufwändiges Reengineering schon im Ansatz vermieden. Polarion Software is a leading provider of a 100% browser-based and unified platform for Requirements-, Quality-, and Application Lifecycle Management (ALM). The company serves global organizations in a wide range of industries from automotive to medical device and aerospace – creators of products that people trust – achieve agility, traceability, and compliance for their complex products. ©2016 Polarion Corporation - A Siemens Company Impressum | Privacy Statement Site comments or problems? info@polarion.com Third party trademarks, featured logos and trade names appearing on the site are the property of their respective owners.